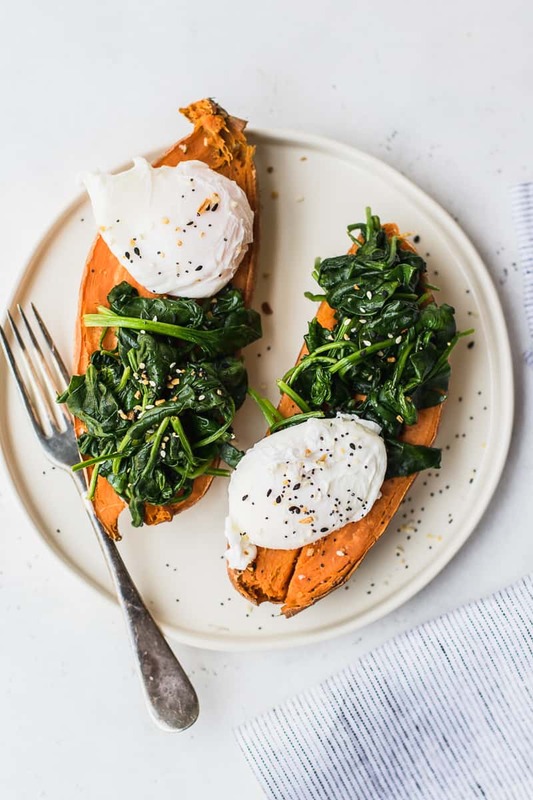 This Poached Egg Sweet Potato Breakfast recipe is what I call breakfast goals. 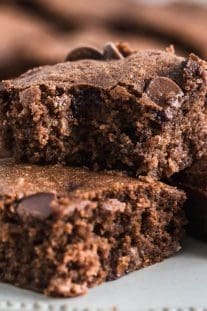 So filling and perfect to kickstart your morning. 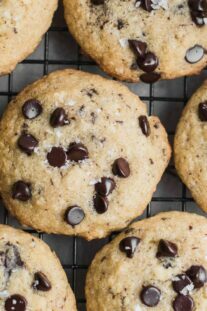 They are also Paleo, Gluten Free, Dairy Free and Whole 30. 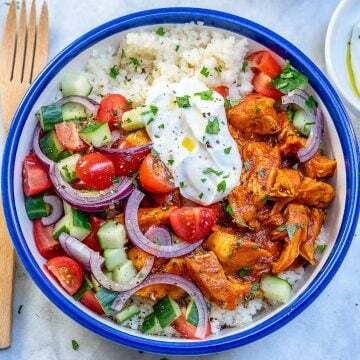 Do you often skip breakfast? 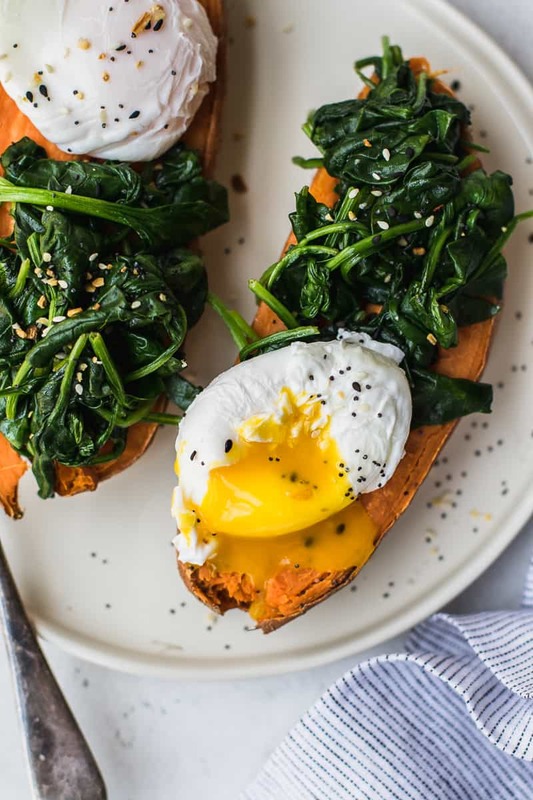 Jumpstart your morning with this Poached Egg Sweet Potato Breakfast recipe. 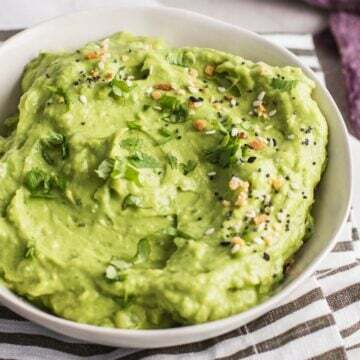 It’s easy to make, nutritious and filling. 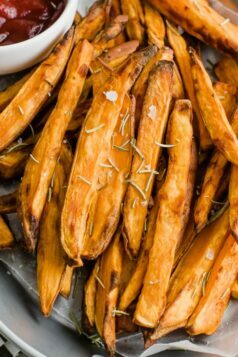 Not sure about you, but my kids love sweet potatoes so much that I often boil some up for them and cut them into chunks and they love it. 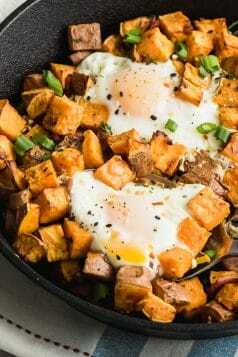 So, when I made this sweet potato breakfast recipe the other day they were thrilled. 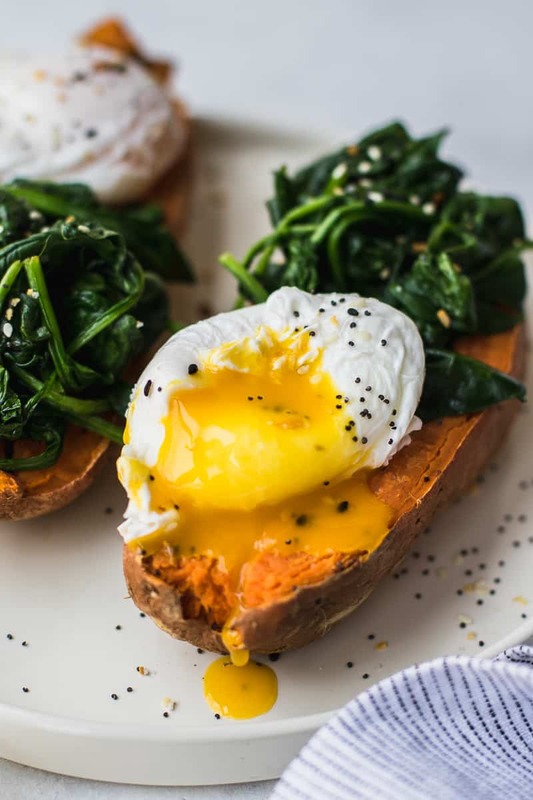 There are many different ways to poach an egg. Everyone seems to have these fancy methods so it all depends on which you find easiest for you. 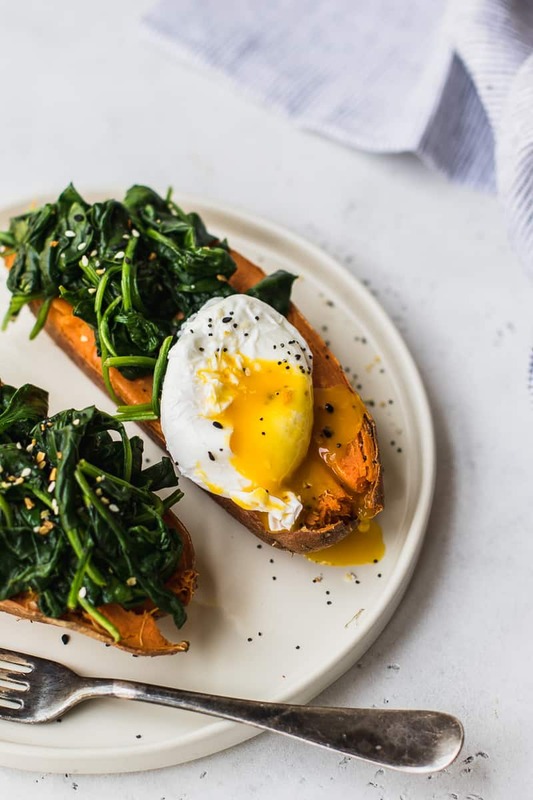 The method I used to poach the eggs for this Poached Egg Sweet Potatoes Breakfast recipe is quite simple. 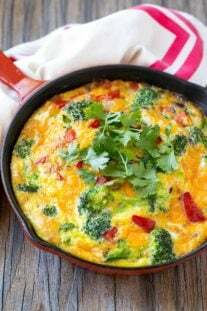 Crack each egg into a small bowl or saucepan. In a deep pan, bring some water to boil. Add a bit of salt and about 1 teaspoon of vinegar. Once the water starts boiling, pour the egg slowly into the pan. Let it cook/boil for about 2 minutes. Then turn off the heat and let it sit for about 8 minutes. Grab a slotted spoon to remove the poached eggs and drain from water. Poached eggs are ready to serve with some salt and pepper, top over toast or whatever you have planned for it. 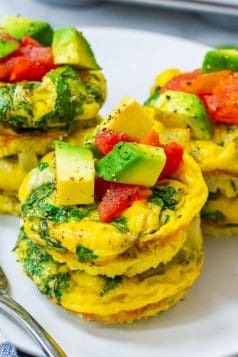 Egg whites, which is the protein part of the egg, starts to set or coagulate as soon as it hits the hot water. For this poached egg breakfast recipe, I added vinegar to the water because it’s been said that vinegar helps prevent the egg whites from dispersing when it hits the hot water and allows the whites to set faster. 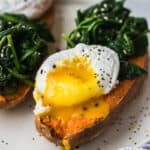 I would love to get some feedback from you in the comments below if you make this Poached Egg Sweet Potato Breakfast. 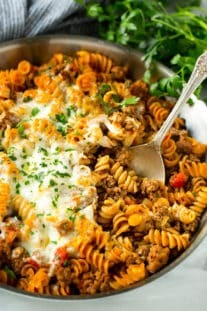 Also, pin this recipe if you plan to make it later and share it on Pinterest! 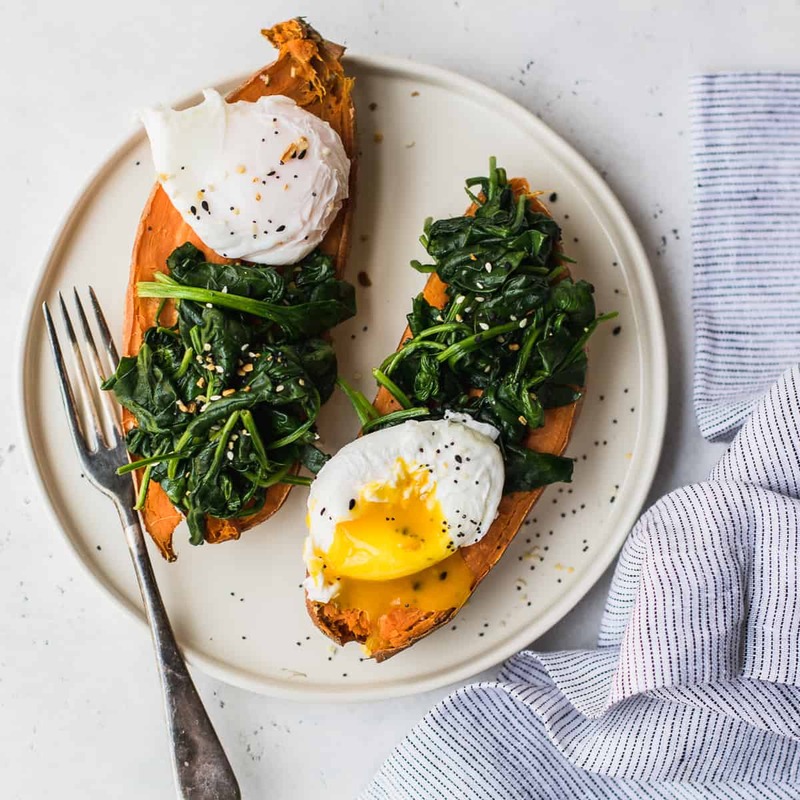 Remember to subscribe to my NEWSLETTER for free and receive all my new recipes like this Poached eggs breakfast Recipe delivered right to your inbox! Easy, nutritious and filling sweet potato breakfast that's Paleo, Gluten Free, Dairy Free and Whole 30. 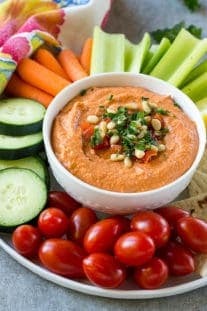 Using a fork, Poke the sweet potato multiple times and then place on a microwave-safe plate. 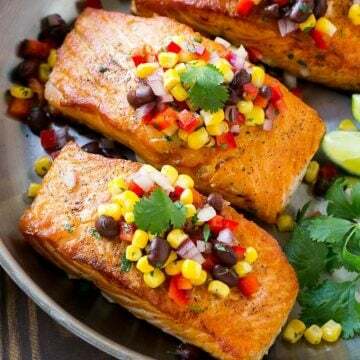 Cook in the microwave for 3-4 minutes or until tender. 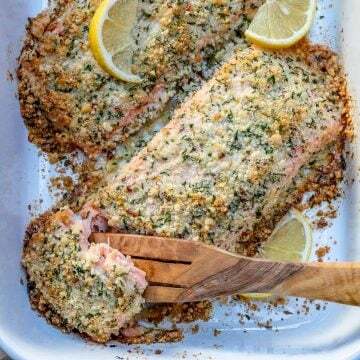 Remove and let cool for 2 minutes before cutting in half long ways. In a large frying pan using olive oil, cook the spinach until wilted. 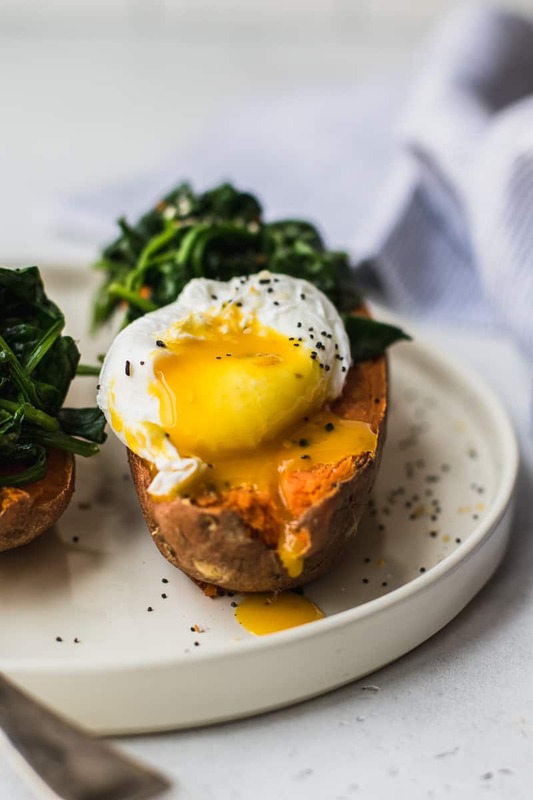 Top sweet potato halves with spinach, poached egg and seasons to taste. I discussed how I poached the eggs in the blog post. Please refer back to that if need be.